I showed IW SGC A-Kerr's Regal Splendor of Medusa during the 2010-2011 show season and met some amazing people along the way. Chris and Gary Jacobson of Speakeasy Bengals happened to be some of those amazing people and they were showing their awesome boy Cowboy Casanova at the same time. Even though he matured into Splendor's competition, I loved his look instantly! Fast forward to summer 2016, Chris offered me Cowboy Casanova's last son and there was no way I could pass on him. 'Ryder' is a simply wonderful tribute to his sire. His blonde background coloring and black outlined rosettes delight me, his personality is sweet and interactive. He constantly wants to be near us, loves to play, and loves to eat! At just 4 months of age he weighed in at 6.5 lbs of pure muscle, at 6 months he topped the scales at 11lbs! He is ferocious with his feather toys, but easy going with the other cats. 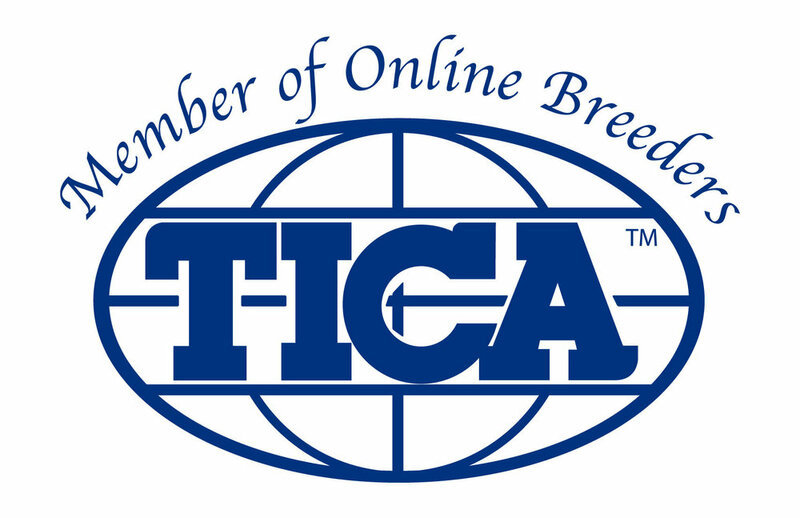 Ryder was shown in both TICA and CFA, he supremed quickly in his few TICA shows and has competed in CFA agility. Ryder took home the prestigious Breeder's Choice Best Adult Male from the On Safari show in Wilmington, Ohio. In addition he also received several finals including a Best Allbreed Cat from Theresa Kempton, out of 80 plus cats. Ryder is now a Regional Winner! He finished the 2017 TICA show season as the top Bengal in the Great Lakes Region, 11th Best Allbreed Cat in the region, and 17th Best Bengal Internationally! Ryder has also earned his AC (Agility Competitor) in CFA. Beautiful head, gorgeous expression and type. Coloring: rich golden-yellow tones, clear background coloring, and red rosettes. Bright green eyes! 7 generations from the ALC Phantom, also has Kibuki, and Art Decco ALCs in the pedigree. Pattern flow, mostly horizontal, lots of acreage and oblong rosettes. Does carry marble. Apb/A, B/B, C/cs, D/D... Super excited to see an ALC agouti variant and the colorpoint restriction gene! From wonderful healthy, championship lines. Sweet, calm, and people oriented. Easy to show, producing sweet, docile babies as well. HCM test is normal as of 3/21/17, 5/2018, 3/2019 . Parents are both rigorously tested. Sire has tested negative 6 times since 2011!